On a grey and rainy afternoon, amid the surroundings of the historic Collins Barracks, the latest collector coin issued by the Central Bank & Financial Services Authority of Ireland was officially launched. Collins Barracks is situated on the north side of the city on an especially high point in Cork which was once an ancient entrenchment known as Rath Mor – or the Great Fort. Its premier position accords it a panoramic view of the city and the River Lee. The day’s events were hosted at the Collins Barracks, north of Cork city centre. Collins Barracks was constructed between 1801 and 1806 out of necessity due to the French Revolution and its conflict with the United Kingdom. The barracks, which is situated on 37 acres and is now the largest working square in Europe, was built to accommodate and train expanding armies which were later mobilized to oppose revolutionary French ideas. 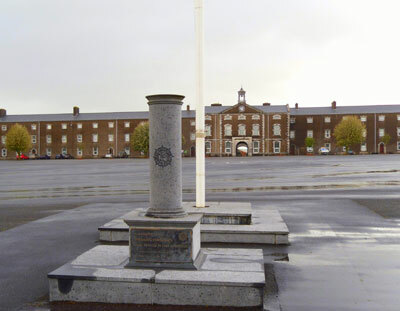 Originally referred to simply as “The Barracks”, the compound was re-named “Victoria Barracks” in 1849 after a royal visit by Queen Victoria to the Military headquarters. After the signing of the treaty between Irish representatives and the British government, independence was recognized in December 1921. On the 22nd August 1922, Michael Collins, then the Minister of Finance for the new fledgling state and a General himself, was ambushed by anti-IRA supporters and fatally shot on his way to review conscripts into the country’s new army, just one day after his visits to these barracks. The Barracks were re-named the “Michael Collins Barracks” immediately his death and in 1925, officially changed to “Collins Barracks” in 1925 and has been known as such ever since. Collins Barracks played host to President John Kennedy when he was helicoptered in, landing in the main square during his official visit to Cork on 28th June 1963. Taking pride of place during the presentation, a portrait of Collins in dress uniform. Today’s event began with a reception held in the Michael Collins Museum, adjacent to the Officer’s Mess, where many personal effects once owned by Collins are housed. Among some items on display is his personal wood writing cabinet, revolver, campaign medal, and leather dress coat. Most especially, his last diary with an entry on the day of his death is kept under heavy security and only displayed on special occasions. Given to the state by relatives of the Collins family, these items are considered national treasures. The reception then progressed to the Officer’s Mess, presiding over the event on behalf of the Officers Mess was Lieutenant Colonel John O’Neill, commander of Collins barracks (who is due to retire shortly), and Commandant Charles Deneen, who introduced the various guests on the day. Minister of Finance, Michael Noonan addresses guests and officially launches the new coins. 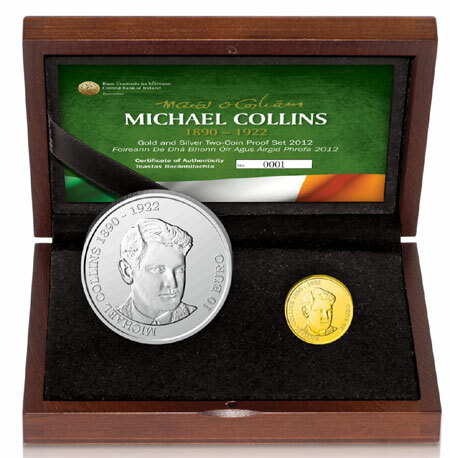 In attendance were such dignitaries as Ireland’s current Minister of Finance Michael Noonan who officially launched the latest gold and silver collector coins. Also in attendance was the Councillor for Harbour Heights – Cork, Dermot Collins and the Lord Mayor for the city of Cork, John Buttimer. Representing the Mint of Finland, where the coins were struck was Mr. Pekka Karkinen, head of international sales. In his comments during the proceedings, Minister Noonan commented, “I am particularly conscious of the difficulties faced by Michael Collins and Eoin MacNeill as the first two Ministers for Finance. Those of us today who sometimes feel that the task facing us may be insurmountable should remember the challenges faced by those who founded the institutions of this State.” Mr Noonan also paid tribute to Ireland’s former Finance Minister Brian Lenihan, who took the decision to deliver the annual Beal na Blath oration in 2010. Noonan commented that it was “a watershed” in the attitude towards the Collins legacy. 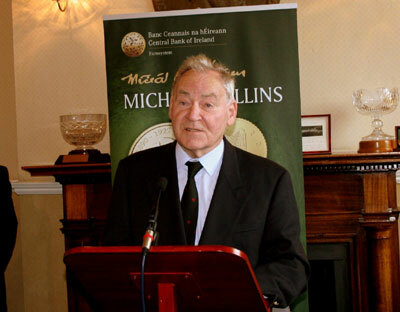 Artist Tom Ryan speaks to the assembled guests during the Michael Collins coin launch. 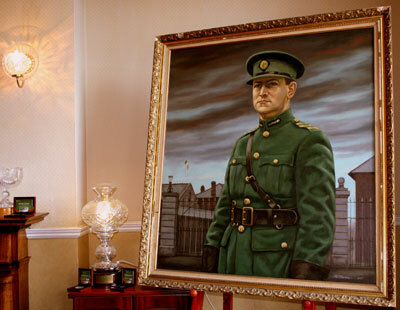 Artist Tom Ryan, known for some of Ireland’s most admired depictions of the Easter Uprising of 1916 and who was chosen to design the milestone coin commented about his commission – saying that Michael Collins was “an iconic figure” and that he found it difficult to capture his image. After the presentation and launch, I had the opportunity to speak with Michael Noonan, Minister of finance about the day’s events and what Collins’ legacy is to Ireland. MA: Michael Collins was I believe the first Minister of Finance for the Irish Free State which emerged by 1922, is this why you’ve officiated over this event? MN: There was a provisional government set up prior to the establishment of the Irish Free State in 1922 so, Michael Collins was Finance Minister of the provisional government from 1919 onwards but he is recognized as the first Finance Minister by all those who subsequently followed especially in the party which I represent – also the party which governed Ireland for the first ten years. Collins is also seen as a founding member of the party after the treaty (recognizing Irish independence). The Central Bank is independent but its relationship with the government is through the department of finance which I head, so I would be the natural link in discussions within the department on how commemorations (from the Central Bank) should take place. MA: Taking into consideration the years denoted on the coin, it marks the 90th year of Michael Collins’ death, why did the Central Bank not wait until 2022 and mark the centennial anniversary of his death? MN: There is a prominent group of people here today (attending the event) largely based here in Cork which honor the memory of Michael Collins, it was their request that there should be a commemorative coin, this coin is the result of their suggestion. There will be a series of commemorations and national anniversaries for the next ten years – from about 1912 to 1922, there was a series of historic events important to Ireland. MA: The Collins Coin doesn’t essentially mark the 90th year of his death so much as it is the beginning of a series of anniversary coins to come…? MN: Yes… rather than having to wait until 2022, the centennial of Collins’ death, the decision was made to start off with the Collins coin and “set the tone” for other coin commemorations to come. MA: 2016 will be upon us soon and that will be the centennial anniversary of the Easter Uprising, Ireland issued an especially memorable 10 shilling silver coin in 1966 for the 50th year of this event, does the Central Bank plan to mark this event once more with a similar distinctive coin? MN: For the Central Bank, there will be on-going consultation with the Finance department to come forward with other proposals for the anniversaries coming up but this coin in particular was the one which had unanimous backing from all of the relevant departments. MA: What are your own thoughts of the legacy which Michael Collins left, and do you think Ireland might have followed a very different path had his life not been so tragically ended? MN: It’s really idle to speculate what might have happened had Collins not been shot at such an early age. (31 years old at the time of his death) The legacy is his agreeing to the treaty with the British government which recognized independence and setting up the first Free State government and also establishing the key institutions of the State. The Garda, the army, the civil service, built on very strong foundations and decided during some very difficult times. The non-armed Police force for instance which still exists and a civil service independent of political influence resulting in competitive entry into the professional civil service. As I mentioned in my opening speech, Collins memory is no longer solely the ownership of one political party, his legacy is shared by everyone in Ireland and crosses both political and social boundaries. 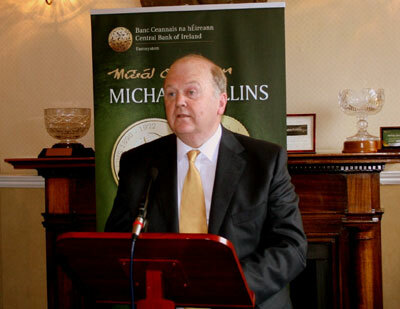 MA: Michael Noonan, Minister of Finance, thank you very much for your time today during the launch ceremonies for the Michael Collins collector coins. MN: My pleasure, glad to see you here! I would like to thank Margaret Daly, Manager of the Collector coin division of the Central Bank & financial services Authority of Ireland for her kind assistance with this article and arranging my visit to the Collins Barracks, it is greatly appreciated. I would also like to thank the Mess Committee of the Collins Barracks for their hospitality. The Michael Collins Museum in Collins Barracks, Cork is open Monday to Friday and located at Old Youghal Road, Cork. All photographs included in this article were taken by Michael Alexander, LBMRC UK. Michael Collins of Ireland was one of the freedom fighter just like Jose Rizal of Philliphine, Jose Marti of Cuba, and Tupac Amaru of Peru. In fact all three (Jose Rizal, Jose Marti, and Tupac Amaru) all has their own commemorative coins just as Michael Collins!